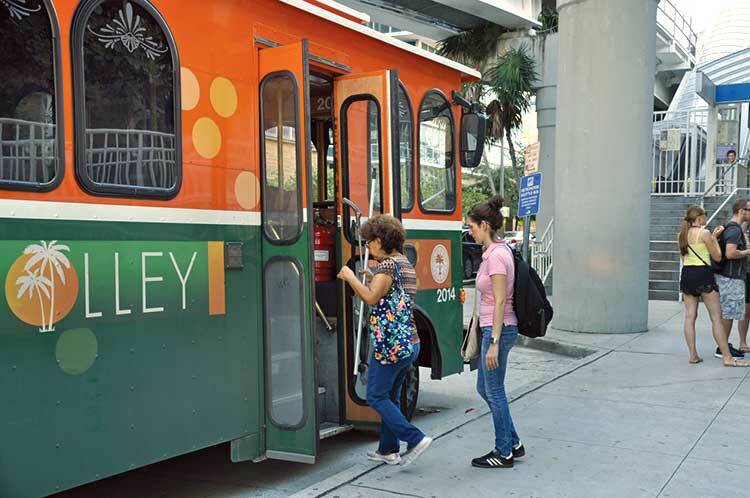 Cities might soon have to feed route and use data for their trolleys and shuttles into Miami-Dade’s transit tracker app: commissioners on Friday backed a plan to better tie the local runs to the countywide network. The measure by Daniella Levine Cava would require cities with new or altered circulators to supply travel and rider data for circulatory and on-demand services like county-run ridesharing every three months. As county transit use has plunged, including a 12% Metrobus drop from last year, local circulators since 2013 have added 10% a year. Integrating their information into the county transit app, as well as funneling the data to services like Google Maps and Apple Maps, would establish a single transit system to provide better and more accurate options, a memo from County Attorney Abigail Price-Williams said. Miami-Dade has progressed in this over two years but hasn’t yet had full cooperation from every municipality, said Transportation Director Alice Bravo, who said the county would need new equipment to accurately track the circulators. About 22% of the transit sales tax that voters approved in 2002 to expand transit now funds the circulators, Ms. Bravo said. “Basically, we’re the ones that allow them to run their routes, so that requires cooperation with us in terms of making sure their routes support our greater network,” she said. The Miami-Dade Transit Tracker, available on iPhone and Androids, provides Metrobus routes and arrival times for Metrorail, Metrobus and Metromover. Of five possible points, the app gets a 3.4 rating in the Apple Store and 4.3 on Google Play, where it has been downloaded more than 100,000 times. About 2½ years ago, the county added circulator information to the app, but not every municipality could provide it. The new rules would help erase a major drawback of increased local circular use: service redundancy, said Rebeca Sosa, who requested an amendment to determine the feasibility of extending circulators into neighboring municipalities that don’t have them. “Maybe [that’s] something that you can bring to the table as part of this mandate that can help us see what those cities do not have – how we can help so we can establish complete articulation, because we’re missing that part,” she said.